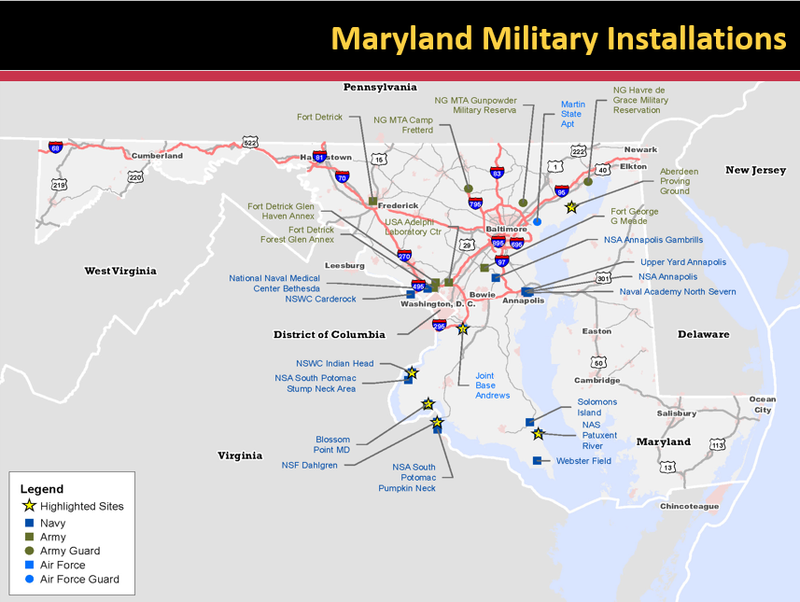 With 20 active military facilities in Maryland, cooperation is important to ensure the continued operational success of these economically vital institutions. Specifically, the project’s purpose is to discover what kind of technical assistance Maryland’s counties and municipalities need to promote compatible community development with bases. The JLUS will also examine potential regional strategies supporting the long-term sustainability of military operations. For example, one goal is to ensure planes landing and departing from military bases do not impact local quality of life; or conversely, that local plans and projects do not negatively impact the day to day work of a base. Planning staff are assisting the JLUS project team in this endeavor. Regional Planners for the Upper Eastern Shore and Southern Maryland, two areas of the state with multiple military installations, serve on the interagency workgroup and collaborate in regular conference calls. They also assisted with the development of an interview letter engaging key stakeholders and the drafting of a survey, found here. The project consultant presented the JLUS effort at the Maryland Planning Commissioners Association Conference in November; you can view the presentation from that session on the conference webpage. This study does not supersede any local planning or zoning authority. Rather, it aims to develop a strategy that local, state, and federal partners can mutually apply to achieve shared objectives. This project will expand upon previous JLUS efforts at Aberdeen Proving Ground, Joint Base Andrews, Naval Support Facility (NSF) Indian Head, Naval Air Station (NAS) Patuxent River, and Blossom Point Research Facility. These JLUS studies can be found here. OMFA has contracted this project with Matrix Design Group – a firm that has conducted more than 45 JLUS studies and 12 Implementation projects across the country. If you would like to be involved in providing feedback on cooperative planning in your area, please contact the JLUS Grants Program Manager, Ms. Jennifer White, at jenniferm.white@maryland.gov, at (410) 767-6445, Matrix Design Group Project Manager, Mike Hrapla, at (443) 995-1295, or Matrix Survey Manager David Wilder at (443) 274-6098.